The SmartStar Cube-G-R80 comes with Alt-Azimuth telescope mount, a.k.a. The Cube. Both axis motors are built into a small single unit which is universally compatible with all telescopes using a dove-tail connection. 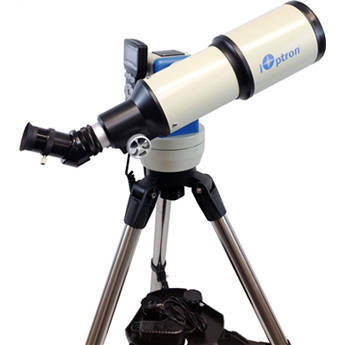 In addition, there are no "dead spots" - so you can point your telescope to anywhere above the horizon, whereas, other mounts block the telescope tube at certain points of rotation. The control system allows you to slew the telescope at 5 different drive speeds, keeping the object within the telescope's viewfinder for as long as you wish. The 8402 hand controller comes with a USB port that tremendously expands the functionalities of the already powerful system. Made of 1-inch heavy-duty stainless steel the Cube Tripod is sturdy yet elegant, and gives the user unparalleled stability during operation. Solid construction joints keep your mount locked securely. All G-series telescopes come standard with a 32-channel GPS module for fully automated operation. Simply turn on the GoToNova Controller and the GPS module will automatically synchronize your telescope location and time with the GoToNova computerized control system. View celestial objects without having to manually punch in the date, time, latitude or longitude.